Author’s Note: The updated version of the monster below can now be found at the Free Game Resources page of World Builder Blog. Thank you for all your feedback and please keep it coming! The South Pole has The Lingering Havoc, but the North Pole holds a terror which strikes from the deep. After all, Canus’ North Pole is merely a surface layer of frozen ocean with dark, cold waters swirling beneath. 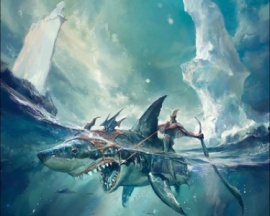 The Dungeons and Dragons fifth edition Exploration Age monster update continues with new statistics for the icebreaker shark. Gotta love October! Like this, but bigger and more bones sticking out of its face. If you missed the first and second posts about icebreaker sharks, here’s their story. Icebreaker sharks are massive fish, a little larger than a great white, which prefer the cold, black ocean beneath the ice of the North Pole. They can sense vibrations in the ice above and stalk prey from below, waiting for them to move into an area where the ice is thin enough to break through. Other times the icebreaker shark prepares a killing ground in an area where prey is known to pass through by thinning the ice. The icebreaker shark has thick bony protrusions on its face and tail, which means it can shatter the dense surface of the North Pole and pull down victims into the freezing ocean, before they even realize they are being consumed. Since the icebreaker shark can prepare its killing grounds, imagine walking through the arctic, suddenly being in a maze or trapped on a slow shrinking island of ice with a 30-foot hungry shark in the freezing depths below. If that doesn’t scare you, you’re probably someone pretty tough, like Vegas Lancaster. 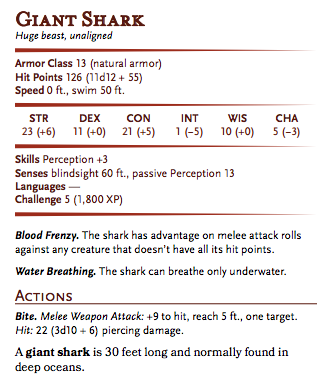 Statistics for the D&D fifth edition giant shark from the Basic rules. So we need to come up with some new statistics for the icebreaker shark to make it nice and terrifying. I started with the giant shark statistics in the Monster Manual and Basic D&D DM rules. It’s the baddest shark available, however it is not challenging enough for my needs to just do a reskin. The icebreaker shark is a loner meant for encounters in the harsh terrain of Glacius and the South Pole in Canus, where there are creatures a little tougher than the giant shark. So I’m giving its stats a little boost and increases its hit points and damage output. I think a challenge rating of 8 is a good place for this creature, which puts it on par with the frost giant and tyrannosaurus rex. In fact, let’s take a look at the tyrannosaurus stats. 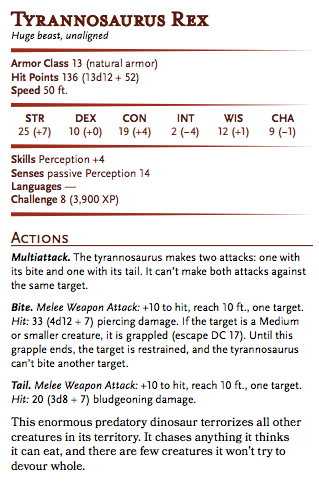 Tyrannosaurus rex statistics from Basic D&D. Nice! So I have an idea of where hit points and damage should be for an equivalent monster. After essentially smashing the giant shark and tyrannosaurus together, I went back to the old statistics for the original icebreaker shark, and took the Ice Smash and Weaken Ice abilities and slapped those onto my awesome dinosaur shark. I also gave the icebreaker shark a little multiattack action, since its tail is almost as dangerous as its head. I think the most terrifying thing about the icebreaker shark, or any shark for that matter, is that you fight it on its own terms in the water. Most of us are clumsy, slow, and at a huge disadvantage in the ocean blue. Add freezing temperatures to that and things become dire. So part of the icebreaker shark’s terror is the environment which comes with it. Speed 0 ft., swim 50 ft. Blood Frenzy. The icebreaker shark has advantage on melee attack rolls against any creature that doesn’t have all its hit points. Water Breathing. The icebreaker shark can only breathe underwater. Multiattack. The icebreaker shark can make a bite and a tail attack, make a bite attack and use Ice Smash, or make a bite an attack and use Weaken Ice. Bite. Melee Weapon Attack: +10 to hit, reach 5ft., one creature. Hit: 33 (4d12 + 7) piercing damage. If the target is a Medium or smaller creature it is grappled (escaped DC 17). Until this grapple ends, the target is restrained, and the icebreaker shark cannot bite another target. Tail. Melee Weapon Attack: +10 to hit, reach 10ft., one creature. Hit: 25 (4d8 + 7) bludgeoning damage. Ice Smash. The icebreaker shark can destroy a 15-foot cube of ice within 10 feet, possibly creating a hole through which the shark can attack. Any creatures standing on the affected ice must succeed on a DC 17 Dexterity saving throw or fall through the ice. Any creature who succeeds on the save ends up in an unoccupied space adjacent to the smashed ice. When the icebreaker shark uses this ability on a cube of ice adjacent to any weakened ice (see below) the weakened ice is also smashed. Any weakened adjacent to the smashed weakened ice is also smashed, and so on for any touching patches of weakened ice. Weaken Ice. The icebreaker shark can weaken a 15-foot cube of ice within 10 feet. This ice counts as weakened for the purpose of its Ice Smash ability. So there you have it. Are you terrified of this creature? DMs, would you use it in your game? Players do you want to fight one? Let me know what you think!!! This month’s RPG Blog Carnival theme is a great one – “What’s in the hole?” This theme is both oddly specific and wonderfully broad. Metaphorically, the inside of a hole could be any place unknown! I’ve already written a few posts about the blank spots in the world of Exploration Age and how some people in the world want to adventure for profit, power, knowledge, or the sake of discovery itself. All those blank spots in Verda, Glacius, the Poles, The Damned Lands, and The Underdark are really just big holes. Heck even portals are holes to other planes. Too bad I already tackled a lot of these topics before this theme was brought to my attention. Dang! So I decided to go less metaphorical and more literal with this one. What’s in the hole in Exploration Age? An enormous, hungry shark. 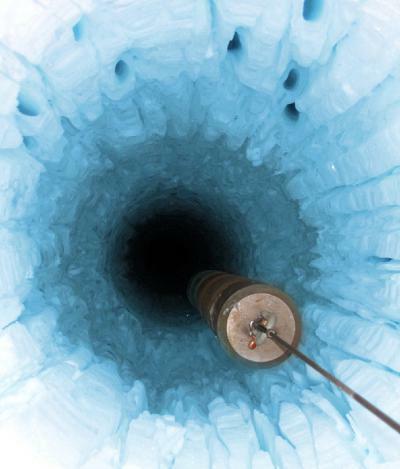 Some of you may remember my post on Glacius and the Poles. It was there that I introduced the world to the icebreaker shark. A man-eating, cold water fish with bony protrusions on its head and tail used to break the frozen layer of ocean beneath the feet of unsuspecting prey. Its finely tuned senses allow the shark to feel vibrations of prey moving on the ice above. This allows the shark to weaken areas of the frozen ocean and prepare a killing ground into which unsuspecting victims will walk. Thus the icebreaker shark of the North Pole has options. It can wait until the moment is right and then break the ice beneath the feet of its prey or it can prepare a trap and when a potential meal arrives break pieces of the frozen ocean around its victims, trapping them in a maze or on an island of ice. Big meals don’t come around for the shark often, so when it can it eats its fill, knowing the next big meal could be a month or longer away in the frozen polar climate. The icebreaker shark eats mostly seals, polar bears, fish, and any other arctic life which crosses its path. They are solitary hunters, but do meet once every Winter beneath the ice to spawn. A typical icebreaker shark can is 20 – 30 feet long and weigh 2,000 – 3,000lbs. They are characterized not just by their enormous size, but by the bony growths on their faces and tails, which resemble that of Ankylosauruses. These growths are what the creature uses to smash through the ice and prepare it’s killing grounds. If one listens very carefully, the smashing and ice cracking of the shark can be heard, but often this sound means it is too late for those hearing it. The howling winds of the North Pole often drown out these warnings for all but those with the keenest hearing. Icebreaker sharks have been known to migrate South as far as Glacius, though such sightings are rare. As far as holes and the RPG Blog Carnival theme go, icebreaker sharks make their own. Sometimes you don’t chose to go down the hole, rather the hole swallows you instead. Dude is RIDING a shark. RIDING A SHARK. Here’s what I’m thinking the game statistics for the icebreaker shark will be. The math is subject to change with the release of the fifth edition Dungeons & Dragons Monster Manual. The icebreaker shark is tough and clever. It believes in ambushing its prey in a prepared killing ground. Should its prey manage to get away, the icebreaker shark will stalk it for days or sometimes even weeks on end, waiting beneath the ice for its victims to drop their guard. It is rare to encounter more than one of these beasts at a time, unless an unfortunate victim unwittingly passed over their spawning grounds in the Winter. Woe to any who make this mistake, for they will find themselves the main course in a shark banquet. Speed 0 ft., swim 60 ft. Senses blindsight 60ft., darkvision 100 ft., tremorsense 100 ft. Aquatic: The icebreaker shark can breathe only while underwater, and being underwater imposes no penalty on its attack rolls or ability checks. Multiattack: The icebreaker shark can make a bite and a tail attack, a bite and an ice smash attack, a tail and an ice smash attack, or two weaken ice attacks. Melee Attack – Bite: +11 to hit, reach 5 ft., one creature. Hit: 36 (6d8 + 9) piercing damage. If the target is Medium or smaller, it must succeed on a DC 14 Dexterity saving throw or be swallowed by the icebreaker shark. A swallowed creature takes 21 (6d6) bludgeoning damage and 21 (6d6) acid damage at the start of each of the icebreaker shark’s turns until is escapes. A swallowed creature is blinded and restrained, but it can use its action to cut its way free by dealing 50 slashing or piercing damage to the gizzard (AC 15). A creature that frees itself falls prone (or more likely finds itself afloat in the ocean) in an unoccupied space within 5 feet of the icebreaker shark. An icebreaker shark can swallow up to four medium or small creatures, and 16 tiny creatures at once. Melee Attack – Tail: +11 to hit, reach 15 ft., one creature. Hit: 27 (4d8 + 9) bludgeoning damage and the creature is knocked prone. Ice Smash: The icebreaker shark can smash adjacent ice in a 15-foot cube, creating a hole through which the shark can attack. Any creatures standing on the ice must succeed on a DC 14 Dexterity saving throw or fall through the ice. Any creature who succeeds on the save ends up in an unoccupied space adjacent to the smashed ice. Weaken Ice: The icebreaker shark can weaken adjacent ice in a 15-foot cube. This ice counts as weakened for the purpose of its Ice Smash ability. So that’s the icebreaker shark and it’s what’s in the hole. Does it sound terrifying? Would you use it in your game? Did I get the mechanics right? Let me know!